My 40th trip around the sun was looming. I needed a way to do some good in this world (and since I can’t afford a ticket, this is my best shot to meet Ellen DeGeneres). So I pooled my resources and bribed my talented friends to put this 13-month calendar featuring local Wisconsin dogs adorned in fresh, local flower crowns from our farm. All profits from the calendars will go directly toward Custom Canine Service Academy based out of Madison, Wisconsin and Cathedral City, California. If you don’t know about this amazing organization, please visit them here. Why would I do this? I wish I could give you some epiphany or rock bottom story…I mean, I’ve been close to both of those. But, I really just wanted to do something nice. I could tell you a thousand stories about my last 39 years and how I got here, but honestly, I have always been and am truly blessed. And I think it’s cool that I can facilitate a bunch of talents to bring one of my crazy ideas to fruition. Period. I love flowers. And, I love dogs. And, I am a veteran that escaped relatively unscathed from the institution. I love life. Big picture: I just wanted a way to share it. 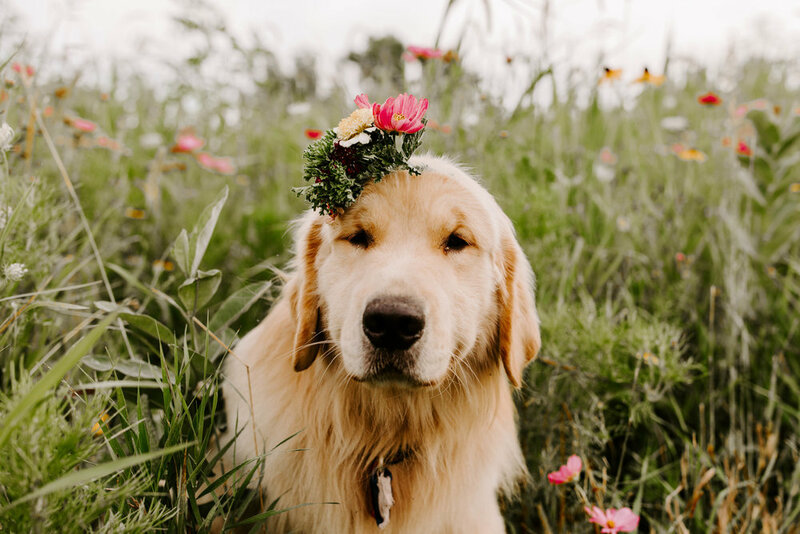 I hope you enjoy the beautiful dogs, flowers and photography as much as I do! Calendars will be sold at a variety of local shops in and around the Madison area (TBD) and online through our website with shipping available in the continental United States. Details will be emailed and posted on social media as we get closer to our launch date of Sunday, November 11th. Please fill out the form below to have the first option to contribute, learn about launch party details and more. Thank you in advance for making my dream of paying it forward come true.